Luggage carries a story. Our travels throughout time create lasting memories. When people donate their luggage to us for children going from home to home (such as foster care), they carry a piece of previous travels with them. We have loved hearing your stories. When we pick up luggage, when you drop it off, when you call us to tell us you have a luggage donation – often those phone calls or meetings to receive the donation comes with stories of where the luggage traveled, who it belonged to, and what it has meant to you. I think of my own luggage, and the stories each piece tells. How one of the beaten up pieces I own has a zipper that no longer functions, but that I keep because of how I obtained it – while on a trip to New York City with one of my closest friends at the time. We each saw bags that we could not resist owning, and we ended up having to carry the large totes with us throughout the entire days journey. No, I will not get rid of it. That piece of luggage has too many laughs associated with it each time I glance at, my shoes pouring out over the top as I embark on whichever journey I am taking. I think of all the vintage luggage we have been given over the years. The vintage luggage holds a special place in my heart. Recently, I gave a friend of mine a ride. As I opened up my trunk, there was a beautiful piece of vintage luggage. It’s faded brown and red hues hold an immense amount of character. As soon as my friend saw it, she audibly drew in a breath and asked if it was authentic. I told her yes, it was, and in fact, we had used that particular piece of luggage for a photo shoot in Union Station to announce our newly instated chapter of Angels Take Flight in the Commonwealth of Virginia. My friend got a kick of the image I painted for her, me riding the metro with the iconic piece that I would then ask our adorable 3 year old model to carry for the photographs. 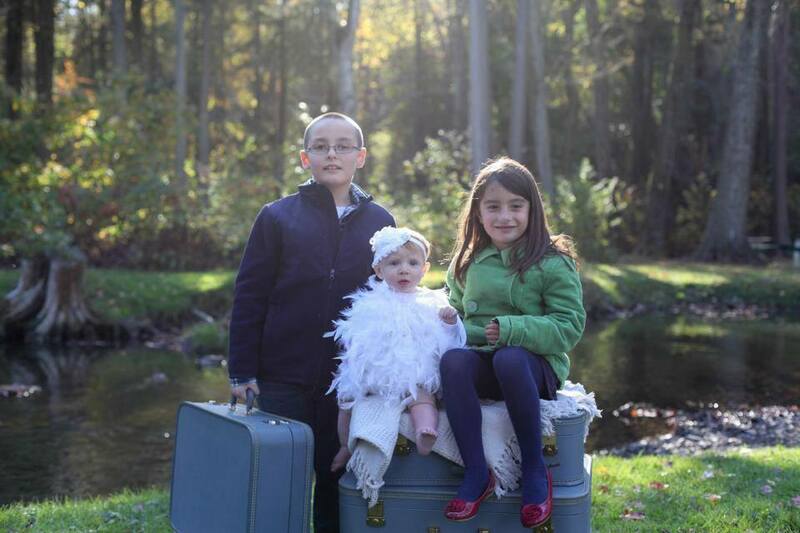 One set of vintage luggage we received early on carries with it particularly touching story. As I received the beautiful set of Lady Baltimore vintage luggage in pristine condition, the donor, a very sweet woman, explained to us she was sure her travels might be ending soon. With as much love and grace that was taken to make the donation to our organization, we knew this luggage was special, and had to be saved for a unique and intentional purpose. As meaningful as the gift was, we knew we wanted to honor her past journeys she had with herlate husband, and honor community children transitioning who were about to embark on theirs as well. 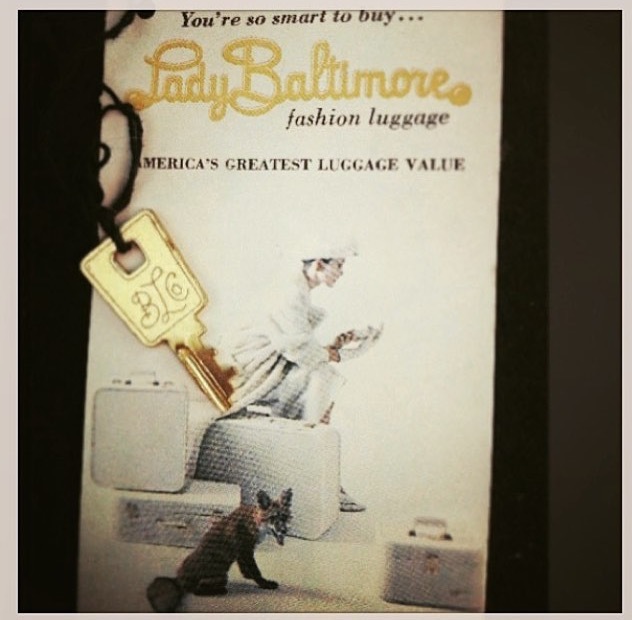 That Lady Baltimore luggage has appeared in our photographs for promotional purposes. We have captured children carrying this luggage boldly, happily and wide eyed hugging this luggage, and we have even photographed a laughing baby donning angel wings sitting comfortably in this luggage. We believe all of these photographs, captured by the incredible Jennifer Garutti, show the various stages, and even positive experiences, a child encounters while on their life adventures. 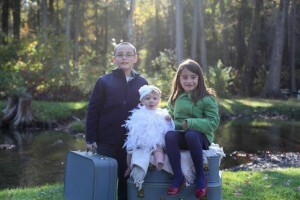 One of the photographs we were able to take with the beautiful vintage luggage. We have the key to the Lady Baltimore vintage luggage framed, with the promotional pamphlet it comes with. The pamphlet shows a graceful and beautiful woman resting easily on the luggage with a classic fur, gloves, and of course, a matching white hat. A protective and fierce looking fox stands in front of the woman, who is unafraid and seems to understand instinctively this is quite the protective animal. How meaningful this image is. It is quite beautiful, and represents so many things. It represents stories, adventures, and memories, while simultaneously honoring both the experiences of our donors and the angelic children we strive to serve. Each day we do the work that we do, we hope the children instinctively also know we are there to help guide them through their journey – much like the fierce and protective fox is portrayed to be in this image.